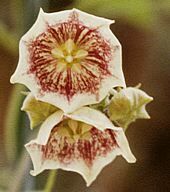 Named for: J.C. Philibert, 1804, French botanist, editor of a dictionary of botany. Philibertia includes 38 species of herbs and climbing perennials with opposite leaves, usually with long petioles and heart-shaped to lanceolate. Shoots range from smooth to pubescent or hairy with white latex sap smelling of garlic. Umbels of yellow or purplish flowers arise from leaf nodes. Philibertiae are distributed from Florida and Texas to California in N. America and Argentina, Bolivia, Brazil, Chile, Ecuador, Paraguay, Peru, Uruguay in S. America. Philibertia has sometimes been included under Sarcostemma, particularly the N. American species, although Sarcostemma species have leafless stems. A climbing perennial with twining, slightly pubescent stems and pairs of cordate leaves. Loose umbels of large cup-shaped white flowers with five pointed lobes, marked with reddish-purple lines and speckles on their inner surface, are produced at the ends of stems. Native to Argentina and Uruguay. 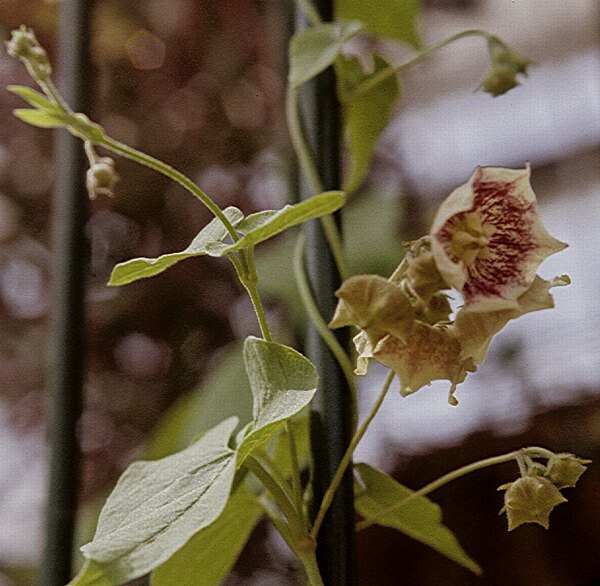 A charming flowering vine to grow in a pot with a climbing frame in a cool conservatory.